Zimbabwe remained locked in a stand-off on Friday as Robert Mugabe the ageing president who is being held under house arrest, refused to resign. The Zimbabwe defence force that led the military action against the president — it insists it has not mounted a coup — said it would continue to engage with Mr Mugabe and that it had made considerable progress in weeding out what it called the “criminal elements”. Several members of Mr Mugabe’s cabinet, including Ignatius Chombo, the finance minister, and Jonathan Moyo, the education minister, have been detained. General Constantino Chiwenga, the army commander, and the 93-year-old president met on Thursday night in an apparently friendly atmosphere, but there was no immediate announcement of what would come next. If Mr Chiwenga cannot persuade Mr Mugabe to resign, the army may consider other measures, including impeachment, which requires a two-thirds parliamentary majority, to force him out. 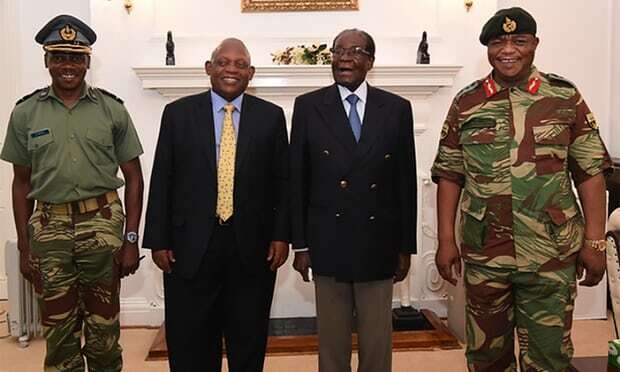 Former and current members of Zanu-PF, the party that has ruled the country since independence in 1980, said if such a move fails the army would either have to leave Mr Mugabe in office or drop the pretence that a coup had not taken place. Morgan Tsvangirai, leader of the opposition Movement for Democratic Change, said: “In the interests of the people of Zimbabwe, Mr Robert Mugabe must resign, step down immediately in line with national sentiment.” He said there was “an urgent need for a road map to return to legitimacy”, which should involve “a negotiated and inclusive transitional mechanism” and eventual democratic elections. Didymus Mutasa, a veteran of Zimbabwe’s liberation struggle who spent years by Mr Mugabe’s side until his expulsion from Zanu-PF in 2014, said the army had not intervened to open up the political process. “I’m not sure this was justified,” he said. “They seem to have come to impose their own candidate, Emmerson Mnangagwa,” he added, referring to the vice-president, sacked by Mr Mugabe last week, who is close to General Chiwenga. “That’s wrong,” he said. Earlier on Thursday, South African envoys held talks with Mr Mugabe and his army chief as regional powers sought to resolve the stand-off. Mr Mugabe travelled by motorcade from his home in a Harare suburb to State House, where the state-controlled media showed him, full of smiles, meeting two South African ministers and General Chiwenga. Mr Mugabe, who has ruled Zimbabwe since independence from Britain in 1980, has been resisting military pressure to resign, said Ibbo Mandaza, a former senior member of Zanu-PF. A Catholic priest has been mediating between Mr Mugabe and army chiefs and attended Thursday’s talks at State House. Members of the Southern African Development Community, a regional bloc that has called on the Zimbabwean army to avoid an “unconstitutional” change in government and urged “calm and restraint”, met in Botswana on Thursday to respond to the crisis. Mr Tsvangirai castigated the grouping for allowing the situation in Zimbabwe to fester for years. Mr Mugabe’s apparent refusal to bow to military pressure, combined with SADC’s stance against an “unconstitutional” change, could delay a transition of power by weeks, analysts said. “They want Mugabe to abdicate. If he refuses, what do they do now?” Mr Mandaza said. People on the streets of Harare said they were reluctant to celebrate until the situation became clear. The military intervention came a week after Mr Mugabe sacked Mr Mnangagwa, who has close ties to the security forces, in a move that appeared to put Mrs Mugabe, 52, in pole position to succeed her ailing husband. Mr Mnangagwa, 75, had fled to South Africa and said he would challenge the rule of Mr Mugabe, who was using the Zanu-PF as his “personal property”. Several Zanu-PF members said they believed Mr Mnangagwa had already returned to Harare, but his whereabouts were unknown. Welshman Ncube, a prominent member of the opposition MDC, said that the military had cast its takeover as a means of protecting Zanu-PF, not helping the people of Zimbabwe. Even so, he said, if the stalemate with Mr Mugabe could be overcome, this might be the “beginning of a different direction for Zimbabwe altogether, never mind the intention of those who started the process”.